The hijab is an act of obedience to Allah and to his prophet (pbuh), Allah says in the Qur'an: `It is not for a believer, man or woman, when Allah and His messenger have decreed a matter that they should have an option in their decision. And whoever disobeys Allah and His Messenger, has indeed strayed in a plain error.' (S33:36). Allah also said: 'And tell the believing women to lower their gaze (from looking at forbidden things) and protect their private parts (from illegal sexual acts, etc) and not to show off their adornment except what must (ordinarily) appear thereof, that they should draw their veils over their Juyubihinna.'(S24:31). Allah (subhana wa'atala) made the adherence to the hijab a manifestation for chastity and modesty. Allah says: 'O Prophet! Tell your wives and your daughters and the women of the believers to draw their cloaks (veils) over their bodies (when outdoors). That is most convenient that they should be known and not molested.' (S33:59). In the above Ayaah there is an evidence that the recognition of the apparent beauty of the woman is harmful to her. When the cause of attraction ends, the restriction is removed. This is illustrated in the case of elderly women who may have lost every aspect of attraction. Allah (swt) made it permissible for them to lay aside their outer garments and expose their faces and hands reminding, however, that is still better for them to keep their modesty. Allah (swt) had shown us the hikma (wisdom) behind the legislation of the hijab: `And when you ask them (the Prophet's wives) for anything you want, ask them from behind a screen, that is purer for your hearts and their hearts.' (S33:53). The prophet (pbuh) said: "Allah, Most High, is Heaven, is Ha'yeii (Bashful), Sit'teer (Shielder). He loves Haya' (Bashfulness) and Sitr (Shielding; Covering)." The Prophet (pbuh) also said: "Any woman who takes off her clothes in other than her husband's house (to show off for unlawful purposes), has broken Allah's shield upon her. "The hadith demonstrates that depending upon the kind of action committed there will be either reward (if good) or punishment (if bad). Allah (swt) says in the Qur'an: `O children of Adam! We have bestowed raiment upon you to cover yourselves (screen your private parts, etc) and as an adornment. But the raiment of righteousness, that is better.'(S7:26). The widespread forms of dresses in the world today are mostly for show off and hardly taken as a cover and shield of the woman's body. To the believing women, however the purpose is to safeguard their bodies and cover their private parts as a manifestation of the order of Allah. It is an act of Taqwah (righteousness). 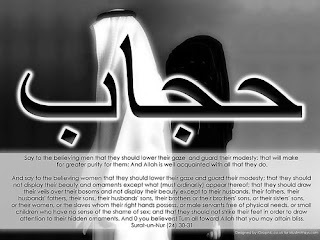 Allah (swt) did not address His words about the hijab except to the believing women, Al-Mo'minat. In many cases in the Qur'an Allah refers to the "the believing women". Aisha (RA), the wife of the prophet (pbuh), addressed some women from the tribe of Banu Tameem who came to visit her and had light clothes on them, they were improperly dressed: "If indeed you are believing women, then truly this is not the dress of the believing women, and if you are not believing women, then enjoy it." There are two authentic hadith which state: "Each religion has a morality and the morality of Islam is haya'" AND "Bashfulness is from belief, and belief is in Al-Jannah (paradise)". The hijab fits the natural bashfulness which is a part of the nature of women.